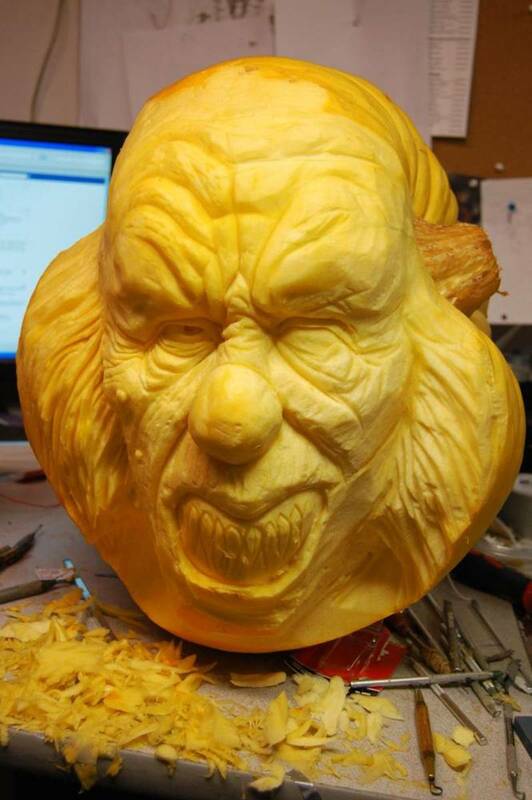 Without a plan in place or any type of personal motive or purpose, artist Ray Villafane began carving pumpkins to inspire his art students at the school he worked for. 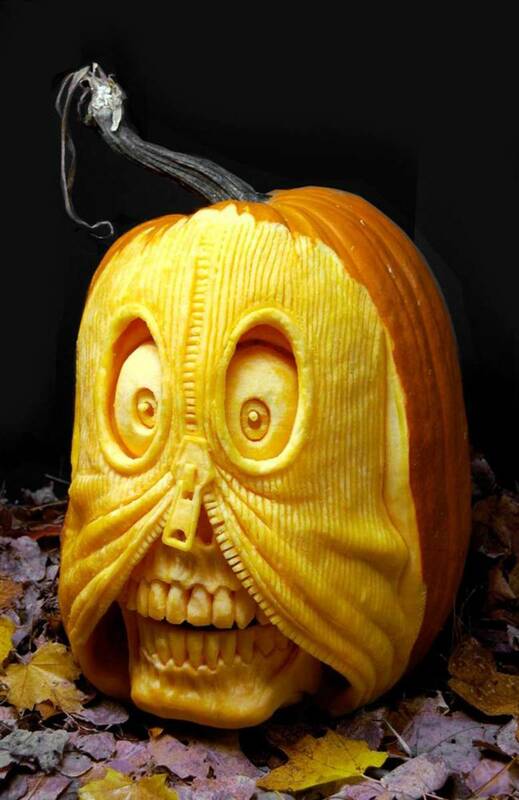 After putting some of his pumpkin carvings on the Internet, his work went viral, generating immense interest in his high quality work. The pumpkin sculptor has been extremely busy ever since, carving up pumpkin masterpieces, for the most part, with a dark and sinister side, with an occasional exception; although it's debatable whether they're scarier than those meant to be disturbing to the viewers. You'll see them below. Separately, Villafane also has created some amazing sand sculptures, including Dante's inferno, which you can look up on the Internet. 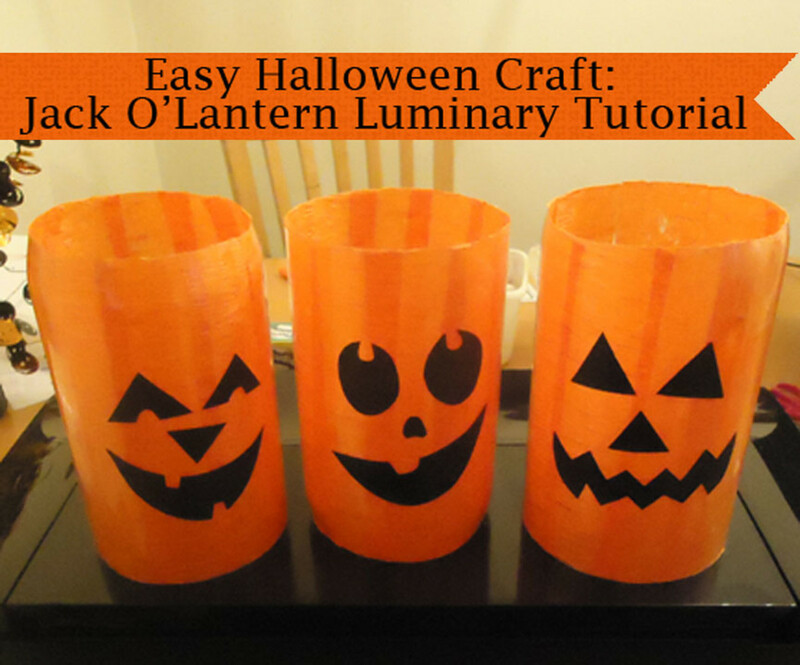 What's interesting about seeing this type of creative pumpkin carving is you can easily get a lot of ideas to incorporate into your own Halloween pumpkin carving. 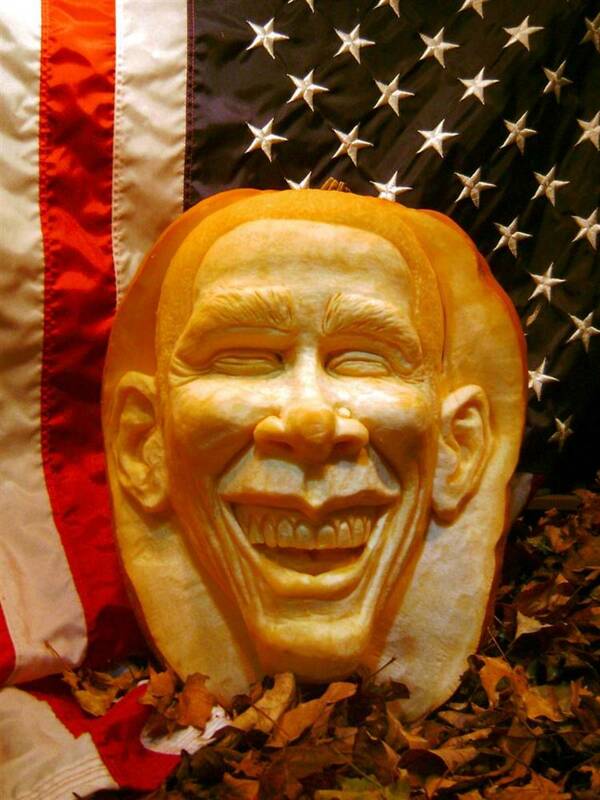 The first offering of Ray Villafane's pumpkin carving work is tremendous. Not only is the detail fantastic, but the disturbing and apparent schizophrenia of the subject matter stands out amazingly. Note the two personalities represented with each side of the head. The snake head carving includes extraordinary detail, one of the identifying marks of Villafane's work. That flickering tongue and lit up red eyes add to the evil look so magnificently portrayed. Those snakes pointing in several directions are amazing. 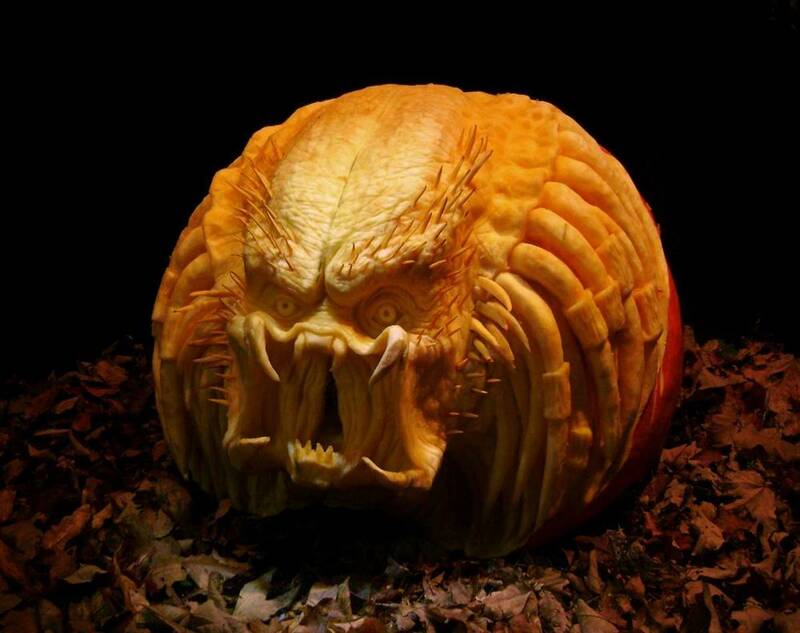 Being a fan of some of the movies included in the Predator franchise, I really enjoyed this pumpkin carving of the beast. It was captured perfectly, and the image reminds you of when it was ready to ferociously attack its main enemy in the films: us. Villafane has a number of similar looking pumpkin carvings, albeit not with the hanging eye as part of the theme. Did you notice the amazing zipper on the forehead of the sculpture? Extremely well done and difficult to do. 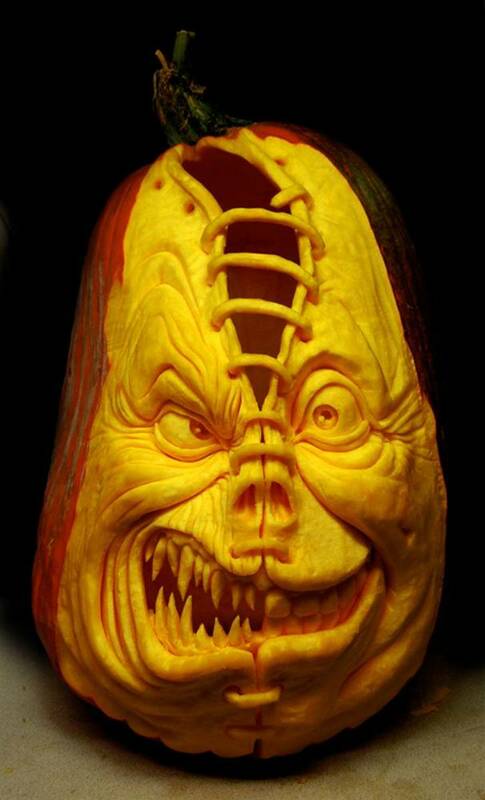 Every time you look at another pumpkin carving or sculpture of Villafane, you wonder how much better it can get, and the one below takes it to another level. The amazing lines, along with another creative use of a zipper are terrific. The folds in what look like the cloth of the hood are extremely well done as well. It's just an unbelievable piece, even if the subject matter isn't appealing to you. 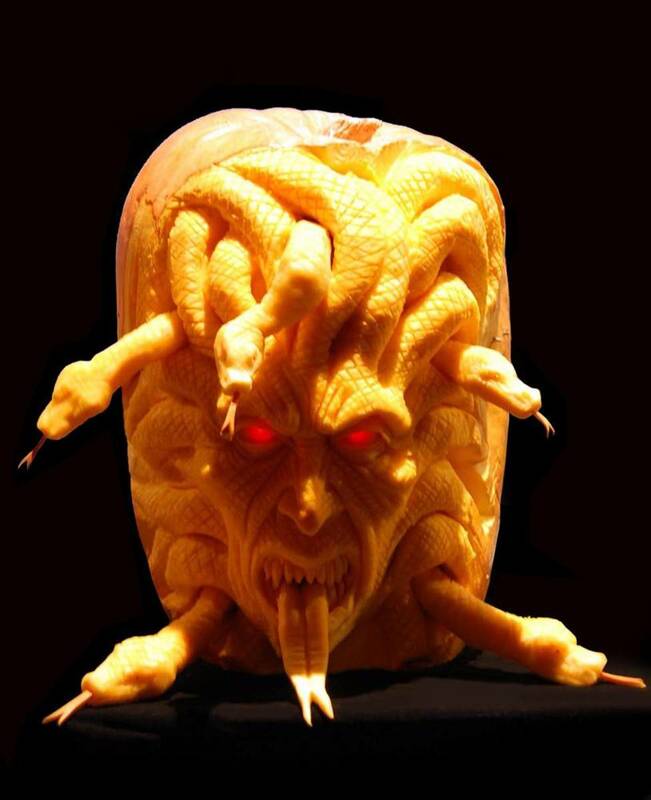 To me the type of pumpkin carving below is of very high quality, not necessarily because of the amount of detail, but because of the subtle capturing of some type of evil in this character he created. The foreboding on the face can be felt when you look at it. To me that's genius to be able to make that type of impression through a sculpture. Although I'm not a fan of David Letterman, Villafane did capture him very well, and the detail, again, is fantastic. I like the addition of the pair of glasses on his face. 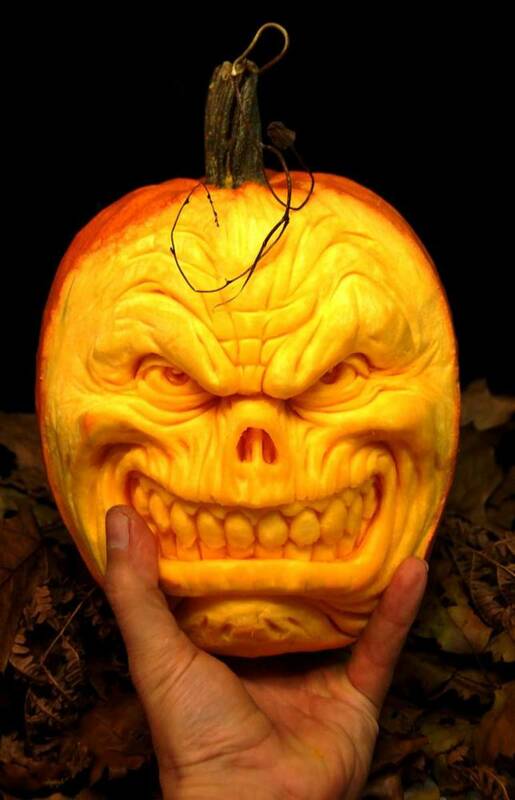 While the face of this pumpkin carving does the right scare job, it is the size and detail of the sculpture that impressed me. Look at the scale in relationship to the hand holding the work. That shows you how small and detailed this head really was. It's compelling how it was made to look so much bigger. I think it's the way he made the cheeks, as well as the eyebrows being narrowed that make this pumpkin carving pattern what it is. 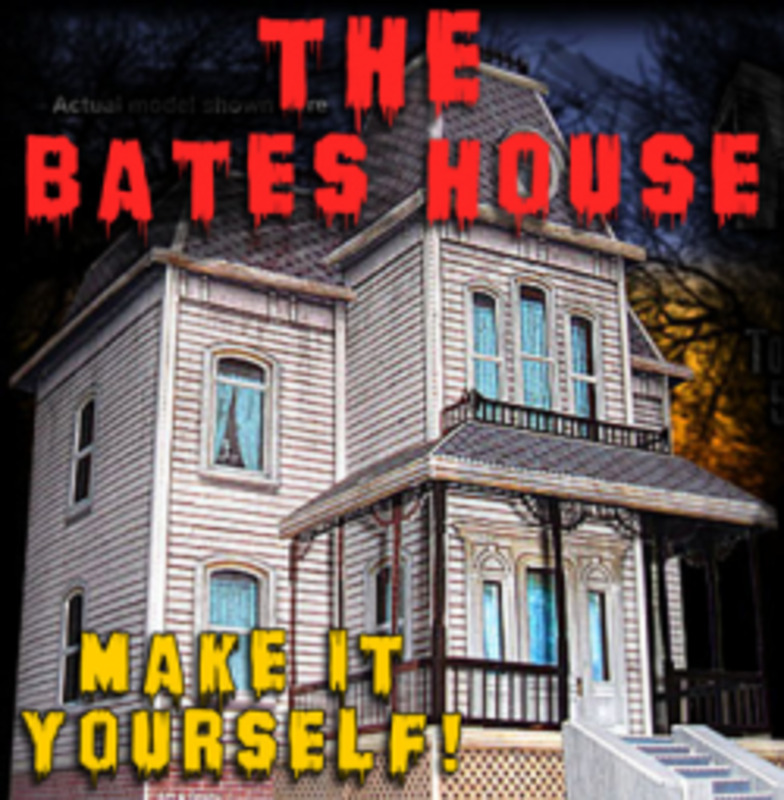 Now for the most scary work that Villafane has done. What can you say about this sculpture? You sure wouldn't want to meet this guy or do business with him! Hehe. Okay, I'm bad. But it is funny in light of how unpopular Obama has become, and how poorly of a job he has done throughout his presidency. 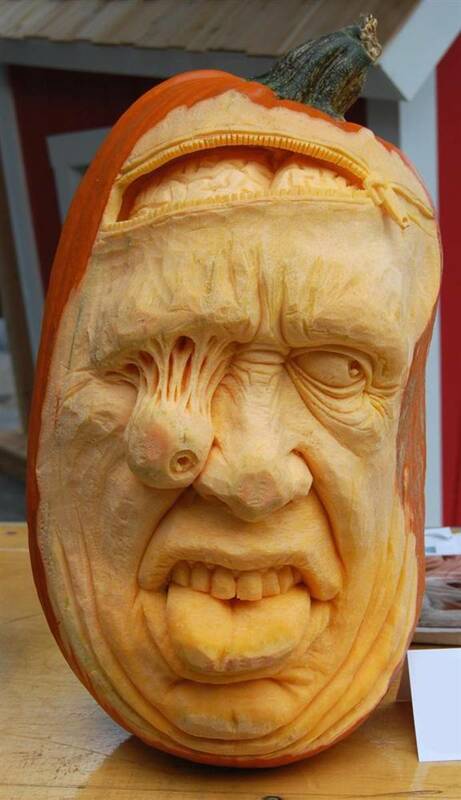 Good carving though, and the way Villafane did the hair was extremely difficult. It is also humorous to look at those big ears of Obama's and how they stick out. As you can see, Villafane is an amazing artist, and his work of the highest quality. 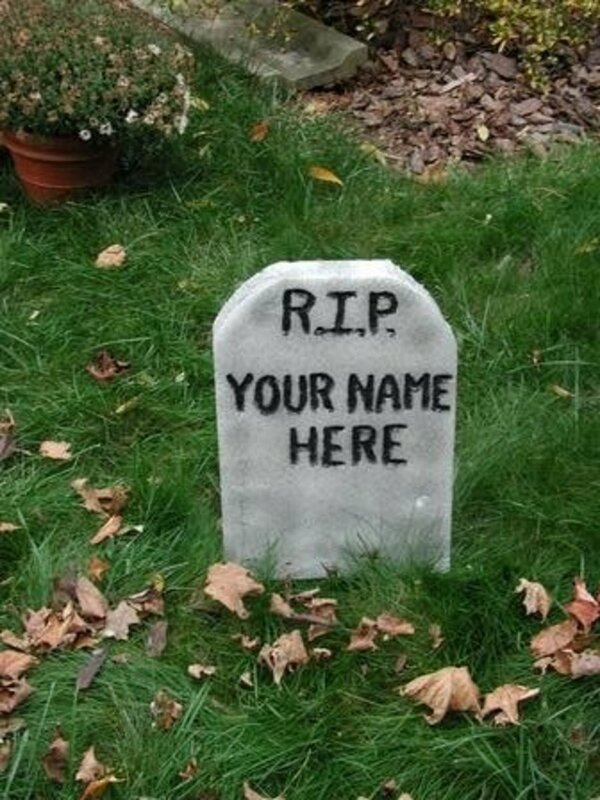 Too bad pumpkins don't last that long, even when you do things to extend the life of the carving. 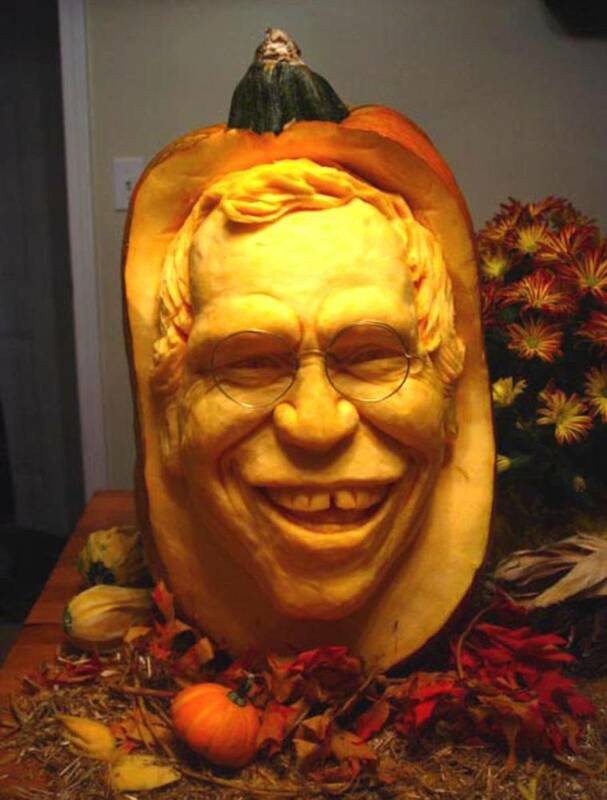 It's incredible to see this type of talent at work using the humble pumpkin as the canvass of choice.